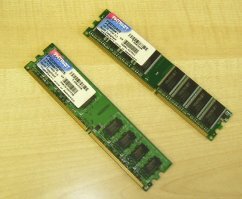 I was researching RAM memory because I needed to upgrade the RAM memory in several of my old computers. I journaled how I researched RAM to buy, so that you can see how to go about it. No doubt there are some other methods, but if you are new to this kind of online shopping, you may appreciate watching me researching to buy a product. 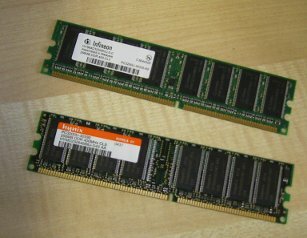 My goal is to see if I can buy RAM (random-access-memory) for my computers cheaper online than here in Saskatoon, my home city. 1. Check computer for the exact type and model of RAM required. 2. Check in the search engines such as Google for RAM memory. 4. Narrow down to most suitable sites to buy from - compare the right RAM memory items. 5. Check out payment and shipping options and costs. 6. Make decision if and where to buy. Should I search in off-line stores too? In my eagerness, I forgot step 1, and entered RAM in the google search bar. The drop down menu shows nothing that hints of computer memory, so I add "computer" - now I get a new list of suggestions, and choose "ram computer memory." Very quickly, I right-clicked and open in new tabs about 9 different links that look like they sell RAM memory. Then I go to explore those. The first one is at ebay, and there is some RAM open for bids that start at .01 - however, these are second-hand and - well, I think I'll keep looking first-- (but I do notice there are about 48 pages of this on ebay, so folks are sure trying to unload their older sticks of RAM. I find a page of charts for DDR2 and discover there are more sub-categories. So I study these in my research for RAM memory. I don't have a notebook or laptop at this point yet, but what about all these other categories? I study some more trying to understand why, and how to refine my search for RAM memory. I switch to a couple of other tabs and explore and learn. On the ArchMemory site I find that I can drill down to my exact computer model, and discover exactly which RAM is compatible; a DDR2-667 MHz for my eMachine EL1200, desktop. I find the link to the exact page for this model of RAM and find that yes, I could get 2 GB of this RAM for $54.99 (retail price is $125.00!) Wow! Further down the page I see I could even get 4GB of RAM for $158.99 (retail price $265.99!) Double Wow! But - would they ship to Canada, and for how much? I find a link for shipping information and have to choose International. There I discvover that yes, they do ship to a few countries outside of the USA, and Canada is one of them. But! The shipping costs by US postal system is $19.99. Hmm? Well, I'll keep looking in case there is a better deal. I still have a number of tabs (sites) to explore. Now that I know exactly what model number to look for, things will go a little faster. At MemoryDepot, which appears to be Candian (as it has prices in CDN), has a 2GB DDR2 667 Mhz strip of RAM at $55.67, and another one at $55.08. But that one says non ECC 5-5-5kit. I need to find out what that means. I had left my tabs open, so on another day I could jump in where I left off. At an open tab for BuyComputerMemoryCanada.com, I see some reasonably priced deals for my model type, but I'm still not sure what ECC stands for so I go to another tab and do a google search on RAM + ECC means. Ah-ha. Just what I wanted, some sites and forums that explain this. I go to read a few. 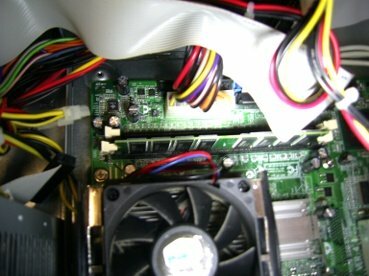 I found a fine page of easy-to-understand explanations about RAM memory for PC computers and laptops. Unfortunately, that site has gone fooey. A definition found on Yahoo answers: "Short for Error-Correcting-Code memory, a type of memory that includes special circuitry for testing and accuracy of data as it passes in and out of memory." 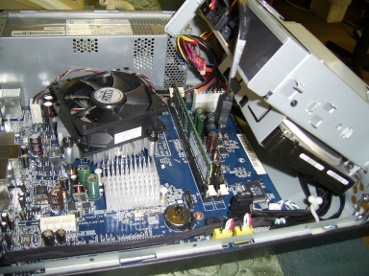 Summarizing from other sites, I learn; most home computers use standard memory, while ECC memory is used for commercial applications where data integrity is very critical. When buying memory, the only time you will see ECC mentioned is if the memory *is* ECC, not if it is *not* ECC. ECC memory is also more expensive since it has an extra memory chip and circuitry to do the error correction. My conclusion - I don't need ECC with the RAM I buy. As an aside I decide to see what kind of RAM I would need for a used CTX EzBook laptop that had been given me. It runs rather slowly, so I hope it might be upgraded. (I've already been warned it may not be possible). However, when I did a google search for "RAM + CTX EzBook" I quickly learned that the max it can take is 128 mb of RAM and I already have that in two RAM strips of 64 mB each. The first site I saw wants over $100 for one strip! I recall ordering the RAM that I have in there when I got the laptop and they only cost me $9 ea then. Well, I tell myself, let's check a bit further... I find on eBay that someone is offering the same thing at $21.50 US. Okay. I think I'll drop this tangent. (Note: these prices may have changed by the time you read this). At TigerDirect they have a Kingston 2048MB PC5300 DDR2 667MHz Memory for $50.97. 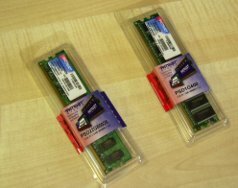 MemoryDepot.com have the same for $48 and up. AllMemoryUpgrades.com has this memory at $30.00 for a 1 GB strip (if it's right). there it is 1 GB for $25.99 & $9.99 shipping. this page has a number of choices with decent prices for 2GB. But now to check for shipping conveniences and problems! On second thought, first I'll see if I can find suitable RAM for my friend Anna's computer, which I have been upgrading with a newer version of our favourite operating system, openSUSE. The tabs for these sites are still open, so I go back over them, and do a search for the DDR type of RAM her old Compaq requires. MemoryDepot.com has it for - 46.72 Cdn. NewEgg.ca shows $42.99 and $43.99 for 1GB. It appears that NewEgg.ca has the best prices online for both types of RAM, my DDR2 667 MHz, and Anna's DDR. But now how does stack up with the warehouse type of prices I've found here in Saskatoon at OTV Tech? If the prices are compariable I can save myself the shipping costs - and have the RAM more immediately. I go to the OTVtech.com site and see that their prices are only a bit more than NewEgg.ca and I will not have to pay the 9.99 for shipping. I think about it and decide to go drop in at the OTV Tech store after work today. When I get there and describe to a young man what I want he disappears, and comes back with just what I ordered, but when I ask the cashier to tell me first how much they are, I discover they are not the lowest price models I saw on the site. The 2GB DDR2 is 48.05 and the 1 GB DDR is $48.70. My total bill, including taxes comes to $106.43. I sigh, and decide to go ahead. I had hoped to get away with a bit less, but that is still not as much as it would have cost me to get the DDR2 at Newegg.ca and the DDR at another place, and pay for the taxes and shipping on both. I've installed the DDR in my friend's computer, as you see by the photo above. The photo right here shows the two strips of RAM I took out of that computer. I'll save those for another older computer that may need a bit more memory. As for my own computers, at home and at the office, I had assumed they each had two 1 GB strips so I had intended to give one of them the new 2 GB RAM and put the extra 1 GB in the other computer so that each would have 3 GB all together. I should have opened them beforehand to look. It turns out that both of them already have 2 GB of RAM. So I decided to add this new strip to the office computer giving it 4 GB of RAM. But this means I'll have to go back to buy another one for the home computer when I can afford it. Did you notice how my researching RAM memory online helped me to get a clear grasp of what I needed, and what various stores online are charging? I became a very informed shopper, and an informed shopper is a smart, power shopper! You can do the same with any product you are thinking of buying. Take time to research and learn as much as you can. When you have enough options spread before you, you can make an intelligent, informed choice - even if that means shopping off-line in a store that is walking distance from your house. Need to learn more about Research Before Shopping Online? Sign up for my free email course; it explains things in greater detail.